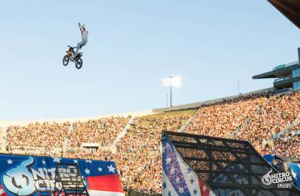 Nitro Circus is coming to Winnipeg on Friday June 9th. It’s going to be an action packed show – lots of new tricks and crazy stunts. It will feature over 30 world class action sports athletes – the best riders in freestyle motocross, BMX and much more. They will perform the biggest tricks in action sports and also some never attempted before stunts. There’s a 40 foot Giganta ramp – so you know people will be flying over it! You can find all the info on their facebook page and updates for Winnipeg. Tickets are on sale now – and there’s even VIP packages available. I love that Winnipeg is getting events like this! Should be an exciting show, and I have a family pack of 4 tickets to give away! 1 – Comment with who you would take to the show with you – and why. Giveaway open to all Canadians, but you have to be in Winnipeg to attend the show. Giveaway will end Tuesday April 4th at noon. **** Congrats to Suzanne who wins the tickets! I would take my son, and the rest of our family. Our son, Evan, is a huge fan of Nitro Circus! I would take Jordan Bobyk and our 2 boys. Jordan has done motocross in the past and has said he wants to teach our boys. This would be a very fun way to introduce them to the sport! Shared the link on Facebook and twitter! Will take my 5 year old son, he loves motorcylces and an outdoors show shouldn’t be as loud as the previous ones at MTSC. I would take my 2 boys !!! They love action and adventure ! I would take my husband and my 2 oldest daughters. We’ve been to Monster Jam and I think we would really this! I would love to take my family!! My kids would be so excited!! Shared on Facebook!! Definitely would take my boys! I would love to take my husband and kids. My 9 year old son would especially love to go! Thank you for the chance. I would take my boys Max, Sam and Chris. Also shared on facebook and twitter. I would take my son and his best friend as this is his best friends birthday! I would take my son and my foster boys. posted a link to the giveaway on Facebook. tweeted a link to the giveaway on Twitter. My husband and daughters! Great family entertainment! Would love to go with my fiancé and our kids!! My eleven year old son would love this! I’d like to take him and a couple friends! The reason I would be thrilled to win the tickets to Nitro Circus is for my 2 grandsons to go with their grandfather and dad. They would truly appreciate the opportunity to go to an event that is too costly for us at this time. Thanks ?? My oldest three boys would be over the moon excited to see this! We watch their videos all the time. I would like to take my son, Lucien Paradis. I would take my son, he loves this kind of action. I would like to take my son, Lucein Paradis. It is something new to us. I would like him to be able to watch it. I would take my son he’s my number 1 man mommy son date ??? I would take my husband and kids, they would love it! I would take my husband and Kiddos!! They would love it!! Km not on Twitter, so I can’t tweet it. Is that OK? My two girls would love this! I will go with them and my hubby. I would totally take my two sons and my nephew! They would be in heaven!!!! I would take my nephews. They live athletic daredevils and I would be the cool auntie for taking them! I would take my nephews. They love athletic daredevils and I would be the cool auntie for taking them! I would take my wife, daughter, and son because it would be an amazing experience for my family! I would take my 2 boys and my husband. My boys have seen the commercial and would love to go, it would be a great family outing. I would send my husband and our three boys! They would all love it!! I’d take my kids with me. I would give the tix to my husband to take our 4 year old and 8 year old sons. Husband has been working A lot lately and the boys would be thrilled to hang out at nitro circus with their dad! We would take our 5 year old nephew, Dorian! Posted link to Facebook also! I would send my husband with the kids. I would take my son and my two nephews, none of them have ever been to one! I would take my two sisters and my neice, something fun for us ladies to do! I would take my son, hubby and niece because they would love to go!! I’d take my son – and then a couple of his friends or cousins. Sounds like fun!! I would take my family. They will surely enjoy this. I would love to take my FamJam! My kids and hubby would have a blast! I would take my sons – they’ve never been but I’m sure they would love it! I would take my 2 sons and nephew who live a few hours away from the city. They would love to see a live event like this. All under 8 and love motocross!!! I would take my 12 yr old son my grandson and my son’s friend – they would LOVE this! I would definitely take my husband and our five-year-old son, plus my nephew who is 10. They all love doing tricks on their bikes (and my hubby was big into BMXing when he was younger!) I think they would love the show. Thanks! I would take my husband, my son (5) and my nephew (10) – I know they would all get a thrill out of it! Thanks for the opportunity! I would take my son and his best friend and his mother. The reason, I would hope that by seeing this both boys would be interested while watching this to be more active and pursue of life sports such as this instead of sitting all day playing video games or watching Netflix. Ooops I only have facebook, no twitter account…but I have shared on facebook. I would love to take my husband and kids because they are all big fans of nitro circus. Hi! I would love to take my hubby and our 3 kids! Pretty please… my boys would go crazy! I would take my husband and 2 oldest children. My son LIVES for adrenaline and would love this! I would take my teenage boys – they would love it. There’s not too many things they want to do with mom these days but I bet this is one they would! I would love to take my son and my nephews as it is right around my nephews birthday! None of us have seen this event yet. Shared on facebook!